Hey Guys, welcome to Geeabo.com. Do you also want to write an article on Geeabo.com? Do you also want to contribute to Geeabo through your article? If yes, then read the instructions and start writing guest posts on Geeabo. How Can I Become A Geeabo Contributor? If you also want your article to be published on Geeabo then you have to follow all the instructions given below. #1. Try to write readers friendly articles – When a reader reads your article, he should feel that he is not just reading something but he is talking to his friend. #2. Your article should be easy to understandable – Try to write articles with easy words. Don’t use complicated words. Easy words help the readers to easily understand the article. #3. Try to write correctly – There should not be any kind of grammatical error and spelling mistakes in the article. #4. Your intention should be clear – Don’t force me to give permission to add your link in anywhere in your article. If you want to add the link in the article then you can request me via email. #5. One photo is mandatory in the article – You have to add at least one visual content such as Images and Videos with textual content. #6. A featured image is also mandatory – If you submit the blog post on Geeabo then it must have at least a featured image. 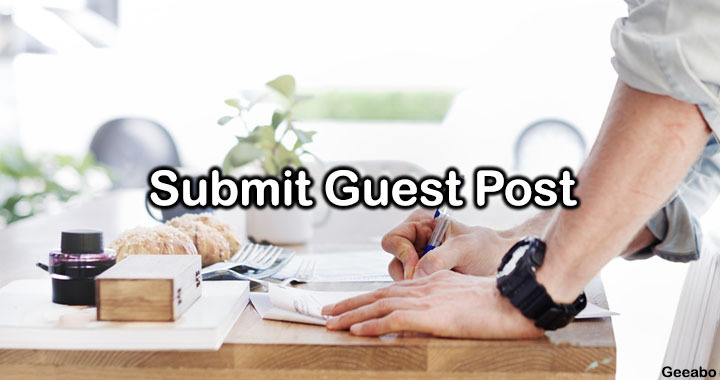 If you have any questions regarding submitting the guest post, feel free to ask me via email. Keep these things in your mind before submitting a guest post. Article Quality:- The article should be at least 400+ words and it should cover the entire topic well. Incomplete articles are not be accepted. Copyright:- If we found that you copied the post from somewhere then all your posts and your profile will be removed. If you submit a post on Geeabo, you will get copyright ownership for that post and it will help you deal with DMCA issues. Credit:- We certainly give you credit for your work, because we respect everyone’s work. Comment: Comments are the conversation and when your article will be published. You will reply to your query related to your article which will give you more exposure and you will also be able to help readers. How to Submit Guest Post on Geeabo.com? If you have read, understood and agree with all the terms given above then you can now eligible for submitting your article on Geeabo. To Submit your post on Geeabo – Go to our Contact Us Page and submit your request. Our objective is to help the people who want to know something new and to reach this article to new audiences. So share your talent and do something new in the community. Many bloggers already contribute articles to the blog and today you can be one of them. Thank you guys. If you have any question regarding the guest post, You can ask with me at our Contact Us page.